Few years ago and with the support of leading European constructors, but also with the signature of Mr Nikolaos Venieris himself, the construction of the hydraulic systems NV (gangways, special platforms, flaps etc) was started. The reason why NV products are today well-known to whole nautical area is that SEA&BOAT always persists in the quality, the excellent design and consequence in the technical support since its foundation in 1986. Having collaborated with the biggest shipyards in Greece and Europe and satisfied the most hard-to-please S/Y owners SEA&BOAT proceed with the manufacture of the special NV hydraulic systems (travel lifts, cranes, boarding ladders) and all these in the most competitive prices of the market. 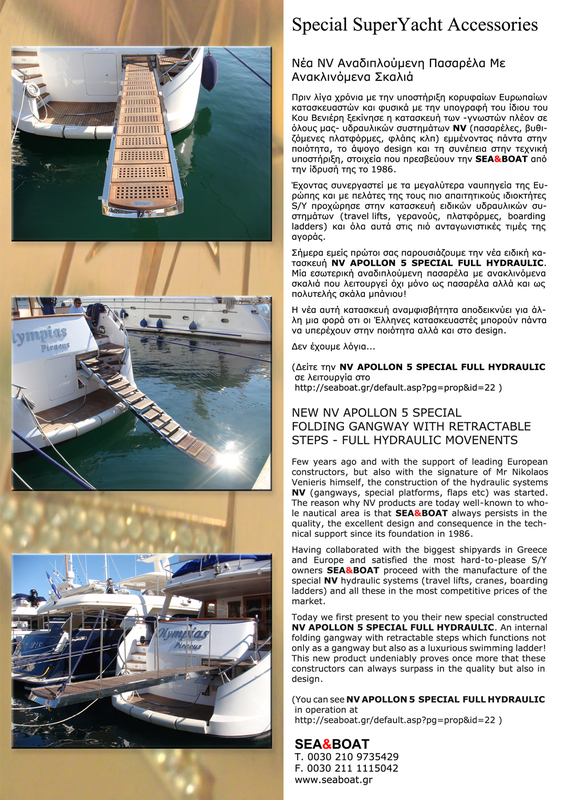 Today we first present to you their new special constructed NV APOLLON 5 SPECIAL FULL HYDRAULIC. One internal folding gangway with retractable steps which functions not only as a gangway but also as a luxurious swimming ladder! This new product undeniably proves once more that these constructors can always surpass in the quality but also in design.